Updated Monday June 18, 2018 by Denis Archambault. On June 16, 2018 at Skyway Arena, Robbie Forbes and Sam Turnock were presented with their official Team Canada uniform and swag for their upcoming trip to the Czech Republic. They leave with the rest of their Team Canada team mates on June 23rd to start their ball hockey journey. We want to congratulate Robbie Forbes and Sam Turnock on their selections to Team Canada based on their performance at this year’s CBHA Junior National Championships held in Kitchener, ON last July. Robbie and Sam have been selected for the U16 Junior Team Canada (East) 2018. For any athlete there is no greater honour than wearing a Canadian jersey and representing the CBHA and Canada at a world level and this opportunity is being presented to them! The CBHA has more than 24,000 junior ball hockey players and literally thousands in this age category so to be recognized as one of the top 22 East players invited to represent Canada at the World’s is no small feat. 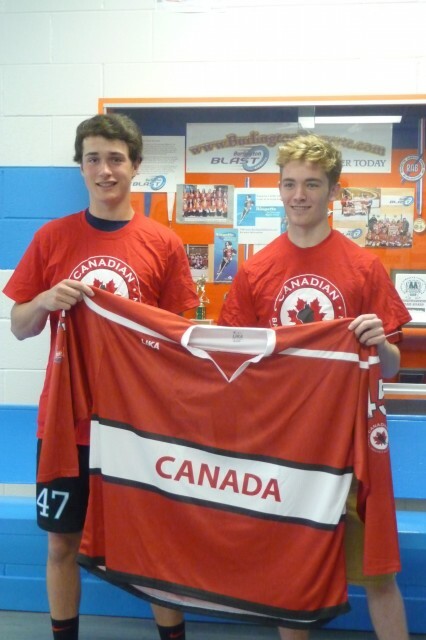 Once again CONGRATULATIONS Robbie and Sam on being selected to represent Canada at the ISBHF World Junior Championships next June in the Czech Republic. We sincerely hope you are excited, enthused and energized as you prepare to take on the World! Standing on the blue line at the end of the game with your fellow Canadian brothers, watching the Canadian flag being raised to the rafters and singing in full voice the Canadian anthem is an amazing athletic/life experience! The friendships, memories and experiencing the European culture will last a lifetime!